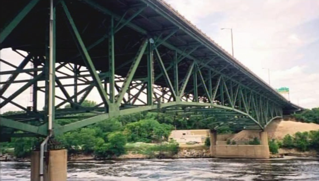 Iron and Steel bridges are used today and most of the worlds major rivers are crossed by this type. 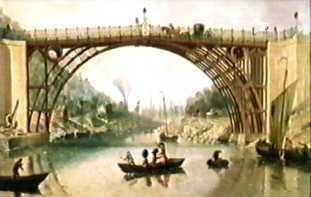 The picture shows the first iron bridge in the world. It was built in Telford in 1779 by Abraham Darby (the third) and was the first large structure in history to be constructed from iron. It revolutionised the way structures were built enabling engineers to build ever larger structures and buildings. Girder bridges often carry railways and many were built in the early part of the 20th century. They are capable of carrying heavy weights. Usually they span short distances. 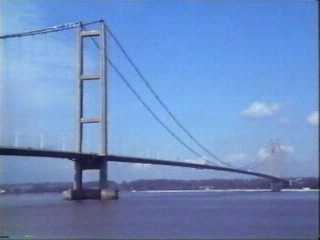 The Humber Bridge was once the longest suspension bridge in the world. 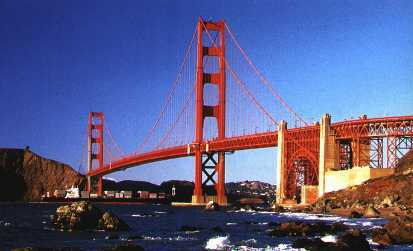 Suspension bridges are the cheapest way of spanning long distances. Cables hold the road in position. A cantilever bridge has a deck (road) which is supported at one end. The Forth Railway Bridge in Queensferry, Scotland is made up of three cantilevers. It was finished in 1890 and took eight years to build. What is the name of the city where this bridge is to be found ? Find it on a globe of the world or in an atlas. What is the name of the city where this bridge is to be found ? 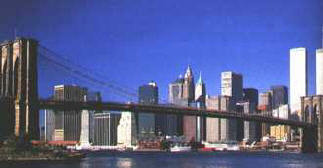 Two famous towers are to be seen on the right - they no longer exist.